The inside account of health care reform’s triumph. When the president and his closest advisers huddled in the Oval Office last August, they had every reason to panic. Their signature piece of legislation, comprehensive health care reform, was mired in the Senate Finance Committee and the public was souring on it. Unemployment was on the march, and all this talk about preexisting conditions and insurance exchanges barely registered above the Fox News pundits screaming, “Death panel!” Suddenly, health care reform was under attack everywhere—even in the West Wing. All week, the group had debated whether to scale back the reform effort. Now, a decision point had come, according to several people who were in the room. Press Secretary Robert Gibbs said he couldn’t keep telling reporters that there was progress on reform when, in fact, it plainly wasn’t happening. Counselor David Axelrod, who viewed health care as a political graveyard, presented a stark view of the president’s falling poll numbers. Axelrod didn’t argue that it was time to abandon comprehensive reform, but Vice President Joe Biden and chief of staff Rahm Emanuel did. Make a quick deal that would extend insurance coverage to parents and children, they urged, and put off broader action until later. Neither man had substantive qualms with comprehensive reform. They simply saw it sucking the political life out of the new presidency, just like it did to Bill Clinton more than a decade ago. Their political logic was impeccable. And, at another time, Barack Obama might have heeded it. Universal health care had not been a defining cause for him before his presidential bid. During one of his first policy tutorials on the subject, back in 2006, advisers were dismayed that he spent the session typing away on his BlackBerry—attention they believed that he desperately needed to spend mastering intricacies. Of course, we know how this narrative concludes, with Obama sitting in the East Room, inscribing his signature onto the Patient Protection and Affordable Care Act of 2010—completing a quest that eluded Harry Truman and a trio of his successors. But the question that the president posed in that August meeting still lingers: How did the U.S. system, and its leadership, truly perform in the face of this test? In the immediate aftermath of his legislative triumph, Barack Obama has barely received credit. Polls show the public doesn’t particularly like the new law. Conservatives are livid over the expansion of government. Liberals are ambivalent, disappointed as much with their leaders as with the legislation. There are, in short, widespread questions about whether the ordeal was worth it—and whether the president and Democratic leaders could have charted a better, alternative course. These are questions I asked myself constantly over the last two years, as reform legislation first took shape and, then, as it moved through Congress. I believed that legislation was worth passing—that its champions were, by and large, making the best of difficult circumstances—even if I didn’t like all the compromises. But those are complicated judgments to make in real time, based on only the reporting snippets that come through eclectic sources. What follows is an effort to revisit those judgments, with the benefit of hindsight and fuller information. This is the story of how health care reform came together—and, more than once, nearly fell apart. It’s based on hundreds of hours of conversation over the last two years and a series of interviews with key players conducted in the last few weeks. It is the story of a president with transformational aspirations, a congressional party ill at ease with power, political institutions that have been roundly written off as sclerotic, and an experiment in government action that has only just begun. “I happen to be a proponent of a single-payer universal health care plan.” That’s how, according to a video that eventually went viral, Obama described his position on health care. But the grainy clip came from 2003, when Obama first started running for the U.S. Senate. Obama was no stranger to the issue: He’d watched his mother struggle with medical bills as she was dying from cancer. But his policy thinking on the issue was crude and, by the standards of professional politicians, somewhat dated. “Single-payer” meant government-run health care. And it is what New Deal Democrats had in mind when they first took the idea of national health insurance seriously. Democrats would eventually realize that vision for the elderly in 1965, with the creation of Medicare. But faith in the government dwindled after the 1960s. Government-run insurance would thrive in other countries, like France and Taiwan. But it was a nonstarter here—and Democrats needed alternatives. They found one in an idea the right had begun championing in the 1970s, when even Republicans began fretting over the cost of care but were desperate for a market-based solution. The idea was to give everybody insurance but to make it private insurance, with consumers shopping around for the best plans. Eventually, Clinton proposed such a scheme, one of his signature blends of conservative means and liberal ends. But, for the public, the relevant distinction wasn’t so much left versus right as change versus the same. And, under Clinton’s plan, most working-age people had to dump existing insurance to buy one of the new regulated private plans. Yes, Americans craved security—they wanted to know coverage would be there if they lost a job and provided for them if they got sick. But, by and large, they didn’t want government forcing them to change their coverage, even if it was a change for the better. In the bleak political aftermath of Clintoncare’s defeat in 1994, the Democratic Party’s thinkers and strategists obsessed over how to get the policy and the politics right next time—which was sure to come, since rising costs put medical care increasingly out of reach for even the middle class. Slowly, the wonks gravitated toward an approach that accounted for the public’s anxieties—one that let people with relatively good insurance, the type that large companies routinely provide, keep their coverage. The big changes would be for everybody else—individuals buying on their own, small businesses, and the uninsured. For them, the government would set up a regulated marketplace, where everybody could buy affordable coverage regardless of preexisting conditions. These marketplaces, designed to look like the networks through which federal workers got their plans, would include subsidies so that everybody could afford a policy. It was an idea that lived exclusively in academia until 2006, when political serendipity thrust it onto the Massachusetts state political agenda. Under a special arrangement the state had previously made with the federal government, it stood to lose billions in aid unless lawmakers found a way to increase the number of people with health insurance. Republican Mitt Romney, the consultant-turned-governor eager to burnish his reputation as a problem-solver, seized on the idea of creating these new regulated marketplaces and partnered with the Democratic legislature to pass it. The Massachusetts reforms eventually brought insurance coverage to 97 percent of the state, the highest such rate in the country. MIT economist Jonathan Gruber, one of the plan’s architects, led a group of center-left intellectuals who hyped the experiment’s success and touted it as a model for national action in articles, speeches, and consultation with prominent Democratic Party politicians. Liberals, though, continued to eye these schemes skeptically: They simply didn’t trust private insurance, even the highly regulated and subsidized version in Massachusetts. But soon, a new twist emerged, one promoted most visibly by Jacob Hacker, a political scientist then at the University of California, Berkeley. The idea was to throw a government-run insurance plan into the mix, not as the insurer for all, but simply as an option for people or businesses that wanted it. Backed by a prominent liberal think tank (the Economic Policy Institute) and a new, well-funded activist organization (Health Care for America Now), he pitched this “public option” as a way to provide competition with the private sector, while offering peace of mind to those who trusted government more than the anonymous medical reviewers at a behemoth like UnitedHealthcare. The idea became something of a litmus test for liberals; many not-so-secretly hoped the public plan was a big first step toward single-payer. Conservative voters and most of the business community, naturally, had different priorities. They worried more about what high medical bills were doing to corporations and the federal budget. They feared liberal reforms would address the problem, if at all, through blunt price controls and rationing. But years of research, first developed at Dartmouth, suggested that as much as one-third of medical spending was waste—not paperwork or overhead, but care that simply didn’t make people better. Among those who noticed was Peter Orszag, a former Clinton administration economist who’d become director of the Congressional Budget Office (CBO). Orszag was a fiscal conservative, but he’d come to realize the government’s long-term fiscal problem was largely a health care problem. And the Dartmouth research suggested that it was possible to reduce health care spending without actually reducing care—or, at least, reducing good care. Orszag, a fitness fanatic, became obsessed with this research—and, through his work, helped give it centrist credibility. A new, fragile consensus had emerged. Obama had seemed surer of himself when Stern met him at a Washington restaurant months before. Maybe Obama just hadn’t realized, until that moment in Vegas, how demanding a presidential campaign was—and how he’d be competing against politicians of similar intellect. “I just felt like the valedictorian had met the other valedictorians and suddenly realized that he maybe wasn’t the smartest kid in the class anymore,” Stern told me. But Obama was smart enough to realize he’d blown it in Vegas. He also knew that political pros would be watching the rollout of his plan closely—to see whether he was ready to play in prime time and how he intended to position himself ideologically. Edwards had announced his plan first, back in February, and put on the table an ambitious package to cover all Americans. Not since Clinton in 1992 had a top candidate seriously proposed something like universal coverage. Obama’s plan would call for the same rough mix of ideas as Edwards’s—in keeping with the new consensus, he wanted to leave employer-sponsored coverage in place and create exchanges for everybody else to buy insurance. It would also include extensively documented ideas for reducing the cost of care, which Edwards hadn’t done. But, in a critical move, Obama opted not to require that everybody get insurance. To most policy wonks, the “individual mandate” was an essential ingredient of Massachusetts-style reform; David Cutler, Obama’s chief health care adviser, had written as much in a recent book. You couldn’t require insurers to cover anybody without requiring everybody to get coverage; otherwise, healthy people would wait until they got sick before buying insurance. But Obama opted not to endorse a mandate, except for children. Insurance purchases would be voluntary, at least in the beginning. Reform advocates and experts raised their eyebrows: Did this mean Obama wasn’t serious about reform? Was he paying too much attention to polls, which frequently showed that individual mandates were unpopular? Hillary Clinton hadn’t yet published her own plan. But she (along with Edwards) quickly seized on an estimate published in The New Republic, based on a rough calculation by MIT’s Gruber, that Obama’s plan would likely leave 15 million people without coverage because those people would opt not to buy insurance. Over the coming months, Clinton hammered Obama relentlessly on this point; Obama hit back with ads and mailers suggesting she’d make people buy insurance they couldn’t afford. It was a bit awkward: Former Senator Tom Daschle, an Obama confidant, had written his own book on health care and, like Cutler, had called for a mandate. But the gambit worked well—and Obama won the nomination. John McCain’s decision to introduce a health care plan gave Obama new opportunities to hammer away at the issue, although it also focused attention in a peculiar way: McCain had proposed to eliminate the tax exclusion for employee health-insurance premiums. Pollsters said it was a highly unpopular idea, and Obama attacked him for it mercilessly. This prompted complaints from some Democrats and intellectuals, who believed that such a tax change—in the context of a different reform plan—might be useful. They wondered if maybe Obama wasn’t so committed to health care reform, and, after Obama won, they sought signs to allay their anxieties. A month after the election, Obama tapped Tom Daschle to run both the Department of Health and Human Services and a new White House Office of Health Reform. He reached out to Orszag about running the Office of Management and Budget (OMB). But doubts about Obama’s intentions persisted, even internally. During the transition and, then, during discussions of the president’s first budget, advisers like Axelrod raised some of the same concerns they had aired during the campaign. It was a political loser with the middle class, most of which had insurance; it could kill the Obama presidency. Daschle—who was spending much of his time in Massachusetts, tending to his ailing brother—heard about these discussions secondhand and put the question to Obama directly, in a face-to-face meeting: How serious was Obama about health care? Obama reassured Daschle—this was going to be his legacy. Soon, he would settle on a budget that called for universal coverage and, using an idea first developed by the Treasury Department’s Gene Sperling, set aside a reserve fund composed of half new revenue and half savings within the health care system. Obama’s next move was to hold a summit at the White House, with members of Congress and the leaders of interest groups present. He was going forward. Who was going with him? It was anintimate gathering at Ted Kennedy’s home in Washington—just the senator, his colleague Max Baucus, and three senior staffers who worked with them on health care. Kennedy, who loved historical artifacts, pulled out an original version of the Federalist Papers that his wife, Vicki, had given him as a gift. He also demonstrated one of the home’s architectural quirks: a hidden bar, accessible through a secret door in the sitting-room bookcase. Barack Obama hadpromised to change the way Washington does business. No more negotiating in the anterooms of Capitol Hill. No more crafting bills to please corporate interests. But Obama also wanted to pass monumental legislation. And it wasn’t long before the tension between the two began to emerge. The CEOs came in with serious questions about whether a deal would hold on the Senate floor and in conference committee. The White House, for its part, was pushing for more than PhRMA wanted to give. In a new book, Landmark, the Washington Post's Ceci Connolly describes one key moment--when Rahm Emanuel called DeParle, just as it appeared the two sides were near agreement. After taking the call outside, DeParle announced that PhRMA had to offer drug rebates to more seniors; Emanuel, it seems, was nervous about reform's poll numbers among the elderly. But the White House was also anxious to close the deal. The perception of progress and inevitability was crucial to the administration’s strategy: It would help persuade wavering groups and members of Congress to support the bill, or at least dissuade them from opposing it. Reformers frequently used the saying, “Get on the bus or get run over by it.” But that only made sense if the bus kept moving. Max Baucus wasin a familiar situation: Getting lectured by angry members of his own party. But, this time, it wasn’t just Senate liberals. It was the majority leader. And the speaker of the House. And the president. 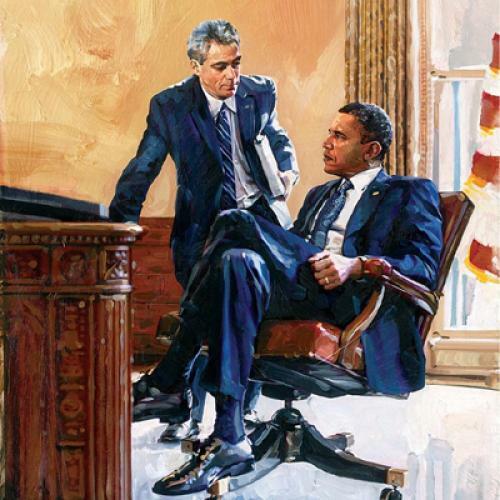 They were meeting in the Oval Office, and the subject was Baucus’s halting progress. Barack Obama, thelaw professor, was acting like a prosecutor. He’d invited Grassley to the Oval Office, to talk about the senator’s concerns. But he was using the occasion to confront Grassley about his latest statements. “Tell me what amendment you want, tell me what language you want,” one administration official recalls the president saying. And then, when Grassley couldn’t point to anything, the official says the president reminded Grassley that the amendment on end-of-life counseling had come from a Republican, Johnny Isakson of Georgia, and simply paid for professional advice when people wanted it. But Obama’s mind was already wandering to the new strategy he’d have to adopt. The first seven months of his presidency had been a test of his belief in civility and bipartisan cooperation. Now, he had the results. They were not encouraging.